Robert (a.k.a. Bob) Wynn passed away December 12th, 2013 in Calabasas, California. Wynn produced and directed over sixty television shows and specials from the 1960s to the 1990s. Born in 1932 in St. Louis, Missouri, Wynn began his career as a radio broadcaster in the 1950s. He was a sports announcer in Missouri, Kentucky, and Ohio. From 1956-1959 he worked for McCann-Erickson Advertising as a producer and director. In 1961, after settling in Los Angeles and working for NBC, he was offered his first major television job producing a Bing Crosby special. Over the next twenty years, Wynn produced and directed variety theme shows, popular and award-winning television series, made for TV movies, and various television specials. Wynn co-founded Alwynn Productions with fellow producer and director Alan Handley in 1962. At Alwynn Productions, Wynn and Handley co-directed and co-produced numerous television shows including, “Alice Through the Looking Glass” (1966) and “Debbie Reynolds and the Sound of Children” (1969). In addition, Wynn worked on a number of productions without Handley. Wynn produced a number of variety shows including Danny Thomas Specials (1962-1970), Tennessee Ernie Ford Specials (1969-1981), “The Monty Hall Show” (1970s), and “Opryland, U.S.A.” (1970s). He was also the producer and director for the variety series, “The NBC Follies” (1973). From 1979-1984 he produced “Real People,” a show depicting the lives of real Americans in humorous, heart-warming, and bizarre situations. This series was nominated for five Emmys, and won an Emmy in 1984. Wynn also produced and directed Bob Hope specials (1968-1979), a series of mystery movies on ABC (1974-1975), shows celebrating America, and the Rock Music Awards (1975-1977). From 1975-1995, Wynn produced and directed the Sammy Davis Memorial Telethons. 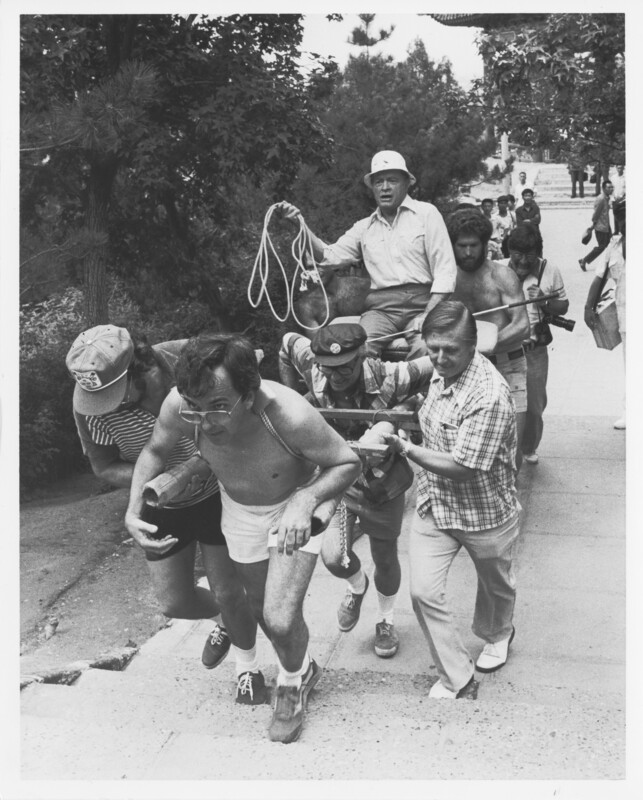 Bob Wynn (front and center) leads Bob Hope (aboard the uncovered palanquin) up China Hill in Beijing in June of 1979 during the taping of a Bob Hope special. Robert Wynn papers, #3211, Box 525. UW American Heritage Center. The American Heritage Center at the University of Wyoming holds Wynn’s personal papers. This collection contains materials from Bob Wynn’s work as a producer and director. There is material from almost all of Wynn’s productions but the show titles with the most material are: “ABC’s Wide World of Mystery Series;” “The Bob Hope Show” and Specials; “The Danny Thomas Show;” Debbie Reynolds shows, “The Monty Hall Show” and Specials; “The NBC Follies;” Opryland specials; “Real People;” “The Rock Music Awards;” Sea World Footage, “The Tennessee Ernie Ford Show;” “The 36 Most Beautiful Girls in Texas,” and Variety Club Telethons. This entry was posted in Current events, Obituaries, popular culture and tagged Bob Wynn, TV directors and producers. Bookmark the permalink.